Joint Andrews Motorcycle Safety Day 2014 | Throttle Life! 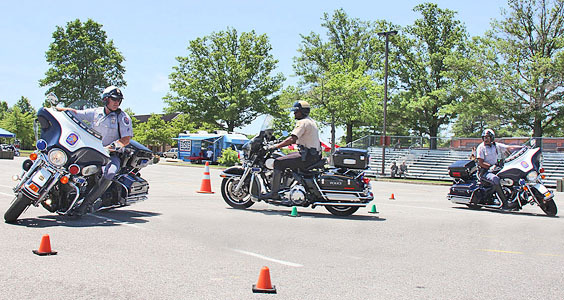 In support of raising awareness and the ever increasing need for motorcycle safety within our branches of service is the impressive 4th Annual Joint Base Andrews Motorcycle Safety Day. This annual event is open for all branches of the military within the National Capital Region (NCR) to include the Pentagon, Bolling, Ft. Belvoir, Ft. Meade, and Patuxent River to name a few as well as the civilian community. The day included a police-escorted off-base ride, live entertainment, riding demonstrations, a bike show that awarded 11th Wing Safety Office, Wing Weapons Safety Manager Harry Waddle with the Best of Show award with his patriotic Stars and Stripes Victory Cross Country. Vendors included Cycle Gear of Laurel, MD, Bobs BMW, Coleman Powersports, Motorcycle Xcitement, Victory of Waldorf, Chesapeake Cycles, C.O.D Cycle Accessories of Waldorf, MD, as well as the USO, The Green Knights (Military Motorcycle Club), and the American Motorcycle Association. The audience was also privyed to expert advice from professional road racer Jeremy Scott, Ride Like a Pro’s Dave Russell and professional motorcycle drag racer Dominic Anderson. “I enjoy attending events like this”, says Dominic. “It gives me an opportunity to share my expertise and experience to help support and raise awareness for motorcycle safety. These men and women give their time and so much more us. I’m honored to lend my experience to support them.” he continued humbly. Other highlights of the day included riding contests that challenged even the most experienced Rider’s skills. Contest consisted of an obstacle course and the unpretentious “slow roll” that put each riders balance and throttle control to the test. Displaying advanced riding skills were the motorcycle units from Prince Georges, Charles, and Fairfax counties, of which all units exhibited the precision, prowess and elegance of an orchestrated rumbling V-twin ballet. During the awards portion, Throttle Life was graciously presented with a Certificate of Appreciation for our efforts in support of this event. This gesture is immensely appreciated and further fuels our commitment to support. We extend our thanks to committee members Ms. Waynenetta Johnson of Millennium Sport Riders and Mr. Freddie Mims of Deuces Wild MC for the invitation and opportunity to be a part of their motorcycle safety efforts and strongly encourage all riders within the NCR to come out and enjoy in 2015. For more information on motorcycle safety, contact the Andrews Safety Office at 240-612-6380. For more photos visit Throttle Life on Facebook. See you next year!